Google’s decision to wipe Palestine from its map app and portray the occupied territories as Israel sparks online protest campaign. Journalists and activists have excoriated Google for wiping Palestine completely off its map app, depicting the entire occupied Palestinian territories as part of the state of Israel. “The move is also designed to falsify history, and geography as well as the Palestinian people’s right to their homeland, and a failed attempt to tamper with the memory of Palestinians and Arabs as well as the world,” the statement continued. In response, critics on Twitter have used the hashtag #BoycottGoogle to condemn the company. A petition on Change.org urging Google to put Palestine back on the map has garnered 147,402 signatures as of Monday, just shy of its 150,000 goal. “The omission of Palestine is a grievous insult to the people of Palestine and undermines the efforts of the millions of people who are involved in the campaign to secure Palestinian independence and freedom from Israeli occupation and oppression,” reads the petition. “Whether intentionally or otherwise, Google is making itself complicit in the Israeli government’s ethnic cleansing of Palestine,” it continues. In 2013, hackers replaced the homepage on Google’s local domain in Palestine with a message calling for the company to remove the name Israel from its map app and replace it with Palestine, arguing that the state of Israel is illegal. 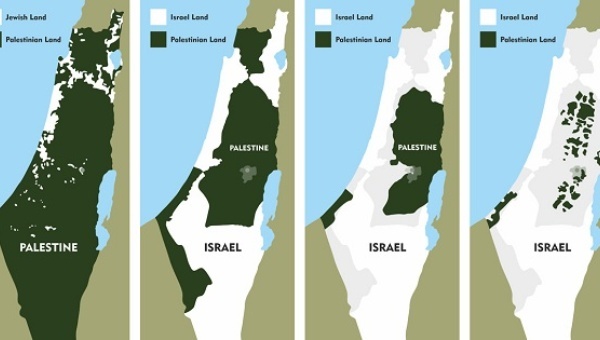 Since the creation of the state of Israel in 1948, which forcibly displaced more than 750,000 Palestinians, Israel has further shrunk Palestinian territories by seizing vast swaths of land. Israel has expanded illegal settlements on tens of thousands of hectares since occupying the West Bank and Gaza in 1967. The United Nations recognizes the state of Palestine with the status of a non-member observer state.